Enjoy some great advice from our expert Eve Pearl, Celebrity Makeup Artist on covering your acne scars. I completely understand your issue, since I've suffered with covering up my acne scars myself. The trick is not to use shades that are too light. There are several makeup lines which will work for the best cover up. Derma Color...which is the thickest and water resistant comes in a huge variety of shades. You can spot apply the concealer to where you need to cover up. My tip on applying the makeup would be to put your foundation on first...that's right. First the foundation and then see where you need the extra coverage. Follow that with the concealer. Use a shade in the beige/yellow tone to cover up any red marks. If your have a hole/scar, I would recommend using a small synthetic brush to apply the concealer with, instead of your fingers or a sponge. This will ensure the concealer stays where you want it. 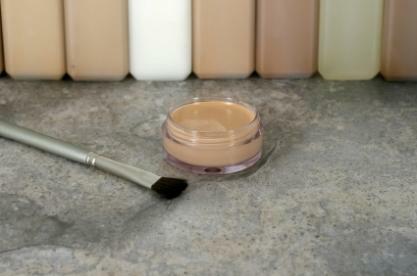 Then blend the surrounding areas with the foundation already on your face. Make sure when you're done, that your face and neck look the same color...and that at lease in some areas of your face, you can see some skin. When applying the foundation first, you can wet a sponge to make any cream foundation go on smooth and more sheer. Then, the concealer and the most important thing is to powder your face. Anytime you use creams on an area, I would suggest using loose powder to set it with. This will actually make it look more natural and make sure it does not move around. If you have a chance, take a look at my website and the colors I use as concealer and foundation.